These guidelines will help you reference the Google Pay brand within your websites. If this convenience method or the supported languages don't suit your needs, contact us. Google Pay payment buttons are available in two variations: black and white. Each variation comes with and without the "Buy with" text. Payment buttons with localized versions of the "Buy with" text are provided. The Google Pay brand is always untranslated. Don't create buttons with your own localized text. If you place a Google Pay button next to another button, make sure the Google Pay button is of equal size. Always use a Google Pay button that contrasts with the background on which it appears. When you adjust the size of the Google Pay button, always maintain height, width, and padding rules. Always maintain the minimum amount of clear space on all sides of the Google Pay mark. The minimum amount of clear space is equal to the height of the 'G' in the Google Pay mark. Use the Google Pay mark to represent Google Pay as a payment option and continue to use it throughout your buy flow. Use the Google Pay mark to indicate Google Pay as a payment option in payment flows. Don't create your own mark or alter it in any way. Always use an uppercase "G" and an uppercase "P" followed by lowercase letters. Don't capitalize the full name "GOOGLE PAY" unless it's to match the typographic style on your website. 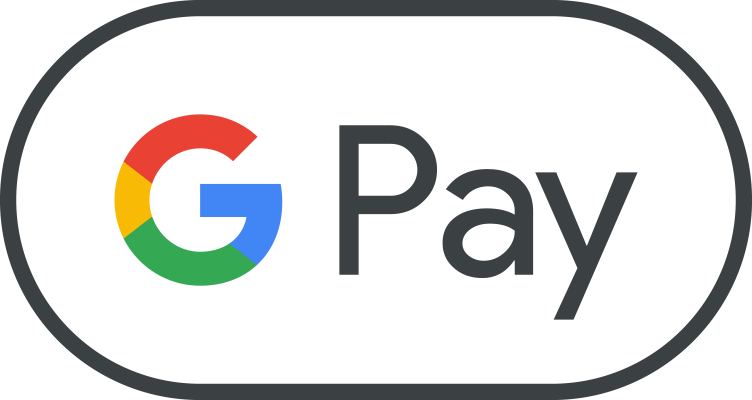 Never use an uppercase "GOOGLE PAY" in your marketing communication. Set "Google Pay" in the same font and typographic style as the rest of the text on your website. Don't mimic Google's typographic style. Always write "Google Pay" in English. Don't translate it into another language. When you use "Google Pay" in your marketing communication, show the trademark symbol, ™, the first or most prominent time that it appears. Don't use the trademark symbol when you indicate Google Pay as a payment option on your website. If brand identities aren't displayed for other payment options, represent "Google Pay" with text. Set “Google Pay” in the same font and typographic style as the rest of the text on your site. The Google Pay button brings up the payment sheet. On the payment sheet, customers can only select and confirm a single payment method and shipping address. Be sure to get all of the other information you need – such as an item's size, color, or quantity, the option to add a gift message or apply a promo code, or the ability to choose different shipping speeds and destinations for individual items – before you give customers the option to select the Google Pay button. If a customer doesn't provide any necessary information, offer real-time feedback to let them know what's missing before bringing up the payment sheet. The above screens represent a recommended Google Pay buy flow for a shopping cart experience. 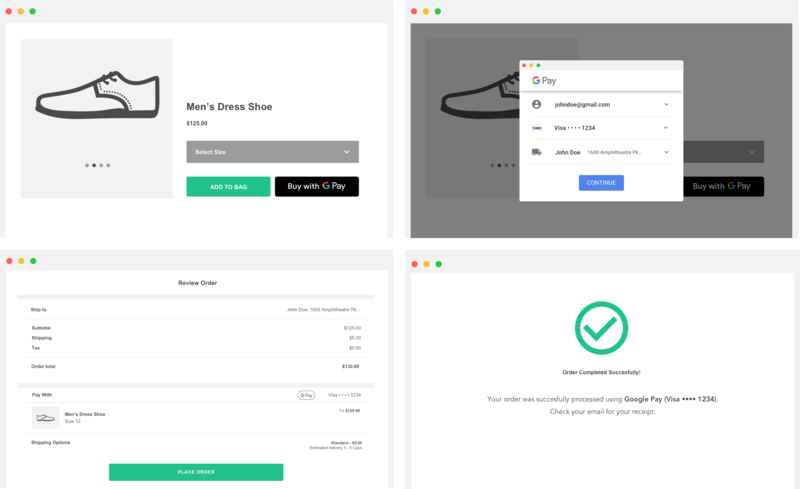 Once you've integrated the Google Pay API, you'll need to get approval for all of the places where you display or reference Google Pay within your website in order to gain production access. Complete our Integration checklist to submit your web integration for review. You should receive approval or feedback within one business day.